In my previous blog I discussed how with some photographic printers, such as Epson Photo Stylus printers for example, you have two types of black ink; one for matt papers (MK) and one for glossy (PK). I also discussed what happens when you print on glossy paper using matt black ink and suggested this could be fixed using a fixative spray. In this blog I will discuss the merits of the most easily available of these sprays. So to recap, the problem with using matt ink on glossy paper is that is does not penetrate the surface of the paper and will rub off. It also produces a matt finish in areas of the image where mainly black ink is used. Using a fixative spray 'fixes' the ink so it will no longer rub off and can help cover up the unevenness of the glossy surface by applying a sheen to the matt areas. 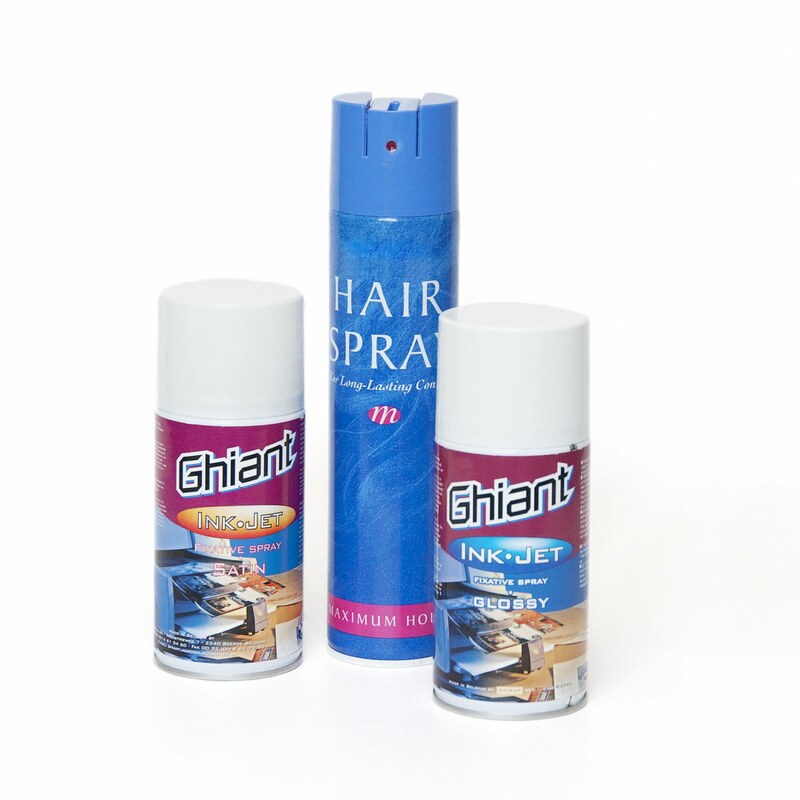 The most readily available brand of fixative spray on the internet is a brand called Giant. They produce three types, Matt, Satin and Gloss. Each 300ml can retails at between £6 and £12 depending on where you shop. There are other brands on the market but they need hunting out. Another common alternative is cheap hair spray which you can get the same quantity for less than £2. I tested the gloss and satin versions of the Giant fixative and compared them with a supermarket own brand hairspray. I printed a couple of images on glossy photo paper and allowed them time to dry. One using my Epson R3000 printer with pigment inks and one on a standard Hewlett Packard photo printer using standard dye based inks. I sprayed a section of each with the Giant gloss fixative following the manufacturers instructions taking care to mask the areas I did not want sprayed so I had a clear line between the coated area and the uncoated. You must use this stuff outside as the fumes are very pungent. After leaving for 10 minutes to dry I looked at the results. The finish was duller than the original gloss of the printed photo except over the matt black areas. The overall finish was smooth and even but not really a high gloss finish I was expecting, however, the black ink was certainly well fixed and would not rub off. The instructions on the can did say a second coat could be applied so I gave it another light spray. This time the finish was less glossy once again but still very even. I would say the overall finish was most satin than gloss. One the image printed using the HP printed with dye based inks there was a noticeable colour change although that lightened as it dried but didn't go completely. I then performed the same test with the Giant Satin fixative. The results were amazingly similar and if anything I would say the finish with the Satin spray appeared actually slightly glossier but that could be my imagination as I was expecting it to be the reverse. There is a YouTube video advertising this stuff and there the guy using the spray seems to saturate the images with the spray when he applies it so I thought I would give that a go as well. Initially it appears to give a good gloss coating that way but once it dries the finish is rough and uneven, so stick to the manufacturers instructions. Last I tested the hairspray. This dies a lot faster and is not so pungent in use as it is designed to be used indoors. Once dry the results were evenly glossy and it even improved the shine on the matt black areas. The black ink was fixed and would not rub or wash off. A second coat could be applied within minutes if required. On the HP prints though, there was a marked change in colour far worse than using the Giant fixative. This did not reduce at all upon drying. I also tried the Giant sprays on photographic matt papers to see if you could turn a matt print into a glossy or satin one. The answer is 'No'. Perhaps if you were to use up a whole can of the stuff with repeated spraying it might work but clearly it is not intended for this and the result is not very pleasing at all. 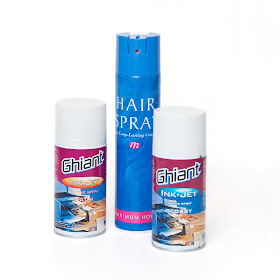 Hairspray will fix a matt print but there are also matt fixative sprays available should you need them. On the face of it it would appear that hairspray is the outright winner here. It is cheap and in the short term seems to give the best results on pigment prints if you want a gloss finish. If you are happy with a satin finish then either the Gloss or Satin spray will do. I say 'in the short term hairspray is the winner' because the fixative sprays claim they incorporate colour fixing properties preventing your colours from fading over time and also have an anti-yellowing formula. The same cannot be said about hairspray and it is quite possible that it will yellow with time. As for the colour fastness, well, pigment inks are not supposed to fade anyway. Well it's been five weeks since I wrote this and since then I have had my test images stuck up in my south west facing study window to see if they yellow. It may be too early to say but so far neither the fixative spray or the hairspray has shown any signs of yellowing. All the images have curled up though and when I tried to flatten them out by bending them the other way, those images that were given a second coat of either the fixative or hairspray, cracked across their surface. Thanks so much for doing this test! Have been printing my own seed packets onto gloss envelopes and didn't know what the problem was with the black ink - had no idea there are even two types. Going out to buy hairspray now. I've not tried it but I doubt you can. However, from my water colour painting days I seem to remember a product called Art Masking Fluid by Windsor & Newton that I believe that could be used for that purpose. Fantastic spray suggestion however have to read more regarding that to give it confirm try. Hi, thanks for the excellent article. It is very informative and helpful. If you still keep the images, could you please comment on any yellowing now one year later? Thank you. None of them seemed to have yellowed but there was cracking. I didn't keep them in sunlight after the first 5 weeks though. so it will no longer rub off and can help cover up the unevenness of the glossy surface by applying a sheen to the matt areas. Not sure how well the hairspray will cope with the humidity of a butterfly house but it would be interesting to find out. You could always try laminating your photos for display in such an environment. Nice info. I am sure the info on your blog will help others, thanks for sharing. quite a handful of learning from this blog..Could i also get this from inkjet superstore? Many thanks for this very useful article; though as I have an HP printer it looks as though I won't be able to use the cheaper, hairspray solution. I don't see any reason not to use hairspray. Just make sure the image has been allowed plenty of time to dry first so as not to smudge any of the ink. Give it a try. Thanks Sally T, however, I've just ordered some fixative spray on Amazon. Don't want to risk the colours changing with hairspray.